Perhaps you would go back and invest a ton of money in Google stock back when it only cost 100 bucks per share. Or, maybe you would go back and switch the numbers on your lottery ticket. What about Facebook founder, Mark Zuckerberg – what would he change? What can we learn from the CEO of one of the most valuable companies of all times? Zuckerberg’s answer about altering the past may surprise you. In light of the recent Cambridge Analytica scandal, going back in time to change key aspects of Facebook is a hot topic. There have been many heated discussions about how Mark Zuckerberg might have done things differently if he could start all over again. Yet privacy concerns is not the only major area of remorse that Zuckerberg feels with regard to Facebook. It’s a mistake Zuckerberg has repeatedly mentioned and one that entrepreneurs and startup founders should learn from. If you watched the movie The Social Network or are a Facebook buff, you may already know that the original name of Facebook was, in fact, The Facebook. Back when Zuckerberg was studying at Harvard, a “face book” was a student directory featuring photographs and details of every student enrolled at a college. So when Zuckerberg created an online, unifying directory of student profiles in January 2004, it made sense to call it The Facebook. To get the company online, Zuckerberg bought a domain name to share his creation with the rest of his school and ultimately the rest of the world. On February 4, 2004, Mark Zuckerberg launched The Facebook located at TheFacebook.com. Although Mark Zuckerberg had considered calling the company just Facebook right from the start, the owner of the domain name Facebook.com at the time, About Face, Corp., understood the value of a premium domain name and wanted a premium price to consider selling it. Rather than going through the hassle of purchasing the domain they wanted and derailing the launch date by spending time on negotiations, Facebook ended up launching on TheFacebook.com for $35 (or thereabouts), which was the standard cost to register a domain name then. Fast forward a year, and the company was resonating with users, growing month over month. 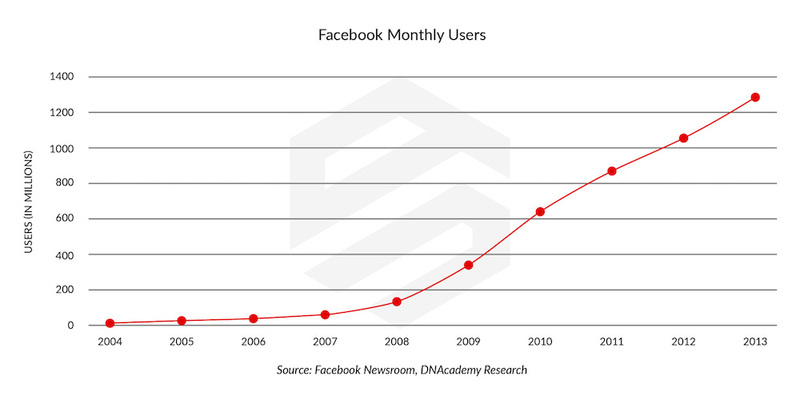 By December 2005, Facebook already had an incredible 6 million monthly users. This name was simpler, more memorable and sleeker. But Facebook came across a big roadblock: it didn’t own the domain name Facebook.com and by this point, Facebook had already become a big hit. Remember the episode of The Office (US) where Dwight sells the last “Princess Unicorn” doll of the holiday season to Darryl? Toby HAD to have the doll for his daughter. He had $200 to buy it from Dwight – already significantly marked up from standard retail pricing – but Darryl just moments before had purchased the very last doll from Dwight. He in turn wanted $400 from Toby because by selling it he wasn’t going to be able to give it to his daughter for Christmas (and he knew Toby couldn’t get it anywhere else). Supply and demand. Without a doubt, Toby regretted not knowing the trend and understanding the value of the doll earlier so he could have saved hundreds of dollars. Similarly, Zuckerberg says he regrets not knowing the trend, not seeing the long game, not going with Facebook.com from the start, and instead building a company on TheFacebook.com domain name. By the time Zuckerberg had the cash to buy the domain name Facebook.com outright, the online social network was already hugely popular and therefore, the domain name that Zuckerberg wanted was very expensive because…supply and demand. The then-owner of the domain name knew that Facebook was popular and eager to get the domain – and that they couldn’t get it anywhere else – and could therefore ask for a more ambitious sales price. Facebook ended up paying much more for the right name than they could have bought it for before they were mega-popular. As for price, sources show that Facebook purchased the domain Facebook.com for $200,000 from About Face on August 23, 2005. In 2010, Facebook paid an even larger sum for the domain name FB.com. It was purchased for a whopping $8.5 million from the American Farm Bureau Federation for use in Facebook messaging. This new, short domain name allows Facebook to assign a personalized Facebook.com email address for every user. Prior to the purchase, Facebook’s employees were already using the Facebook.com domain for their emails, so the company had to switch to another domain, which is why FB.com was acquired. The purchase of FB.com by Zuckerberg and his team shows that shorter domain names in the same genre are always going to be more valuable than longer ones: fb.com > facebook.com > thefacebook.com. According to Crunchbase, Facebook didn’t have the funds to buy a $200,000 domain name back in 2004 since, as of September 1 of the same year, Facebook had only raised a $500,000 investment from PayPal co-founder Peter Thiel. Although the domain was likely not priced as high as $200,000 at Facebook’s founding in 2004, Zuckerberg instead went for the cheaper option at the time. Whether you pay now or pay later, a lesson for all entrepreneurs is that at some point, you will have to pay for a quality brand. Facebook decided to pay later and paid a lot more as a result. Thanks to the company’s success, the $200,000 domain name price tag was not too huge a cost, relatively speaking. By the end of 2005, Facebook had secured a $12.7 million investment from venture capitalists Accel and the company continued their meteoric rise. Prior to going public on May 18, 2012, Facebook had raised a truly impressive total of $2.3 billion in private investment rounds. But Zuckerberg has always regretted starting the company on TheFacebook.com and wishes he had bought the right domain from the start. Facebook.com isn’t the only example of a domain name increasing in price as a company becomes more successful. Twitter is a great example. Back at the beginning of 2006, Twitter’s original domain name was Twttr.com, primarily because the domain Twitter.com had already been registered by another company in 2000. Six months later Twitter’s founders looked to rectify their mistake and bought the domain name Twitter.com for the price of $7,500. This is a lot when you consider domain names can be registered for as low for 99¢, but a steal when you consider that premium domain names sell for $50,000 to millions of dollars today. Kalanick bought the Uber.com domain name in 2010 from Universal Music Group for what was then two percent of the company. However, Uber later decided to buy back those shares for $1 million, a real bargain considering Uber is worth $72 billion at the time of publication. Wanting to go back in time and change things won’t help. But learning from mistakes does. 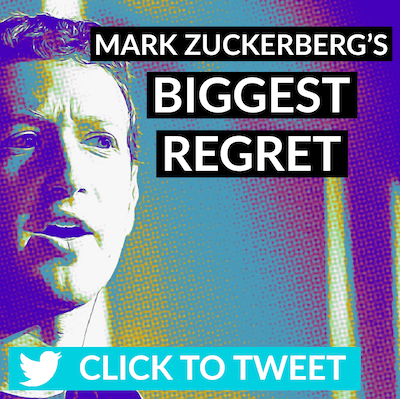 If you’re an entrepreneur or building a startup, learn from Mark Zuckerberg’s regret. When founding your company make sure to think about buying the best domain name that you can from the start, because the price of a domain name will only go up if your company becomes successful. Such a great read. I love your videos, but this article is great too. Thanks for doing what you do, Michael! I try to mix it up and keep it fresh. If you visit https://www.youtube.com/watch?v=sckibXD5l-c you can watch the video version of this article. We’re also on Apple iTunes and Stitcher, if that makes it easier for you to listen. Thank you for reading and taking a moment to post a comment. Great read Mike. I learned about selling your premium domain for 2% of the company from your Domain Sherpa show with Business.com. The Uber.com person did it right – but a big oops on selling out his shares – ouch. You never know with domain names. What appears to be a “no brainer” today was a 50/50 shot 5 years ago. For example, 10 years ago did anyone think that short numeric domain names (like 205.com) would be worth what they are today?! And I also know that if you buy them at the right price, you’ll never go wrong with your investment. Best wishes to you and thanks again for reading. Great post Michael. Just shared it on LI – this is something that all start-ups and businesses planning to set up new entities really need to pay strategic attention to. Thank you for your support, Paul. I appreciate your spreading the word. Your statement is very true. Business schools and start-up incubators talk about validating the idea, raising capital, and hiring and firing quickly — but they lack branding expertise and domain name knowledge. I’m glad Zuckerberg was confident enough to speak out about this important subject, and I hope my article can raise awareness.